This is our first model in the From Imagination to Simulation series. It is a nod to the Halloween season and investigates a zombie apocalypse! Our fascination with zombies continually grows with the help of movies, TV shows, and books that give a wide range of zombie possibilities. But what are the dynamics behind a zombie epidemic? 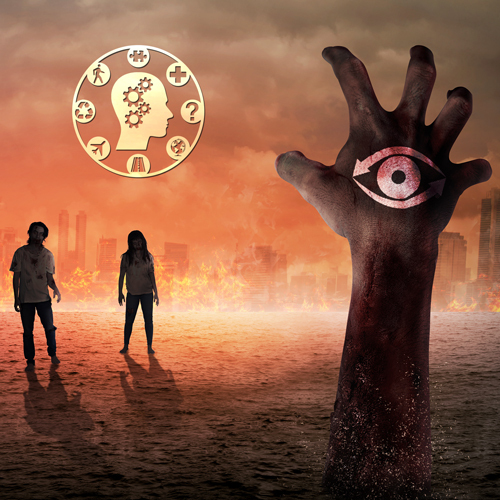 This model will specifically look at the spread of a zombie outbreak and examine some of the variables that help and hinder the rate of infection. We hope you will continue to see the benefits and versatility of Systems Thinking and enjoy our new series, From Imagination to Simulation! Continue to ponder those out-of-the-ordinary problems. They may seem unrealistic, but perhaps some of their dynamics may resonate with reality. Check out our zombie apocalypse model to see if there is any chance for human survival!